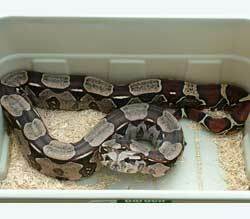 Size: Boas are large, heavy-bodied snakes that can reach 3 meters in length in captivity. Habitat: Wide distribution throughout range. From dry mountainous areas to grasslands and woodlands. The snake's cage should be as simple as possible. Newspaper is recommended as substrate because it is less likely to be ingested and is quick to dry. A cage should provide a thermal gradient that will allow the snake to choose between warm and cool regions. Subsurface heating pads are recommended, but the snake should always be able to move clear of the heating pad. Common boas prefer an air temperature of 80 to 85 degrees Fahrenheit, with a warmer area to lie on while digesting a meal. Common boas can tolerate air temperatures below 60 degrees as long as a heating pad is available. Newborn boas will readily feed on hopper to adult mice almost immediately. As adults, boas can be effectively maintained on adult rats. Large adult boas are easily capable of eating a medium-sized rabbit.